Photolalia: Mission and Third -- Some images... and a few brief words about them. 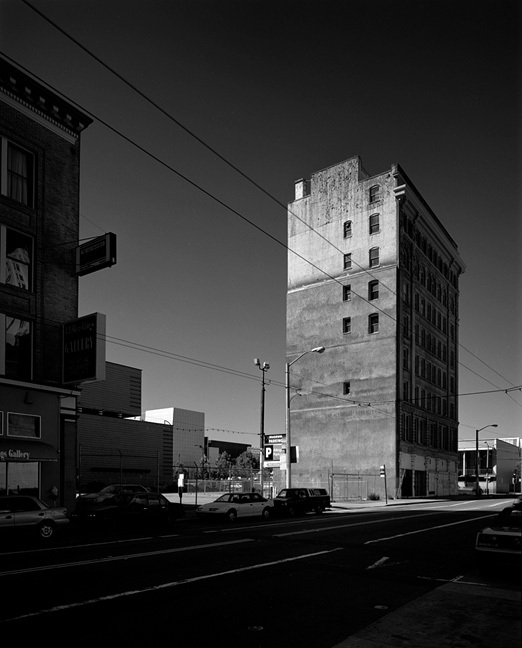 (San Francisco, 2007. Image copyright Hamish Reid). It's obviously all about the textures, shapes, and lightplay on that wall, and the way it stands out sort of naked and unassuming, but it was also about documenting a rapidly-changing street view as SFMOMA opened around the corner and the whole SOMA thing gained momentum (click here for a Google street view of the same scene a dozen or so years later — the building itself has been renovated almost beyond recognition, the wall's hidden again, and the vacant blocks aren't quite as vacant any more…). Apart from printing it, I didn't really do much with the image for a long while afterwards — it got scanned in sometime down the line and just sort of sat there. And then I started the sessions with Lily and got interested (obsessed, perhaps) with combining building facades and surfaces with those other, softer, better-known surfaces, and with a little editing and a composited Move from my Flames series, I sort of couldn't see Mission and Third in the same way again. It's one of a pair of images that uses this building; the other one might surface here one day (or not).